As a genre, the manifesto (the avant-garde variety, not the mainstream political platform) moves in and out of fashion. Political and social upheaval tends to put manifestos back in vogue. The present decade, for example, which seems to grow more apocalyptic by the day, has seen a sharp surge in manifesto writing. Aside from a renewed militancy and political engagement in the arts – a sense that something, anything, must be done – the popularity of the manifesto has been helped by a combination of other factors. The rise of social media, for example, has created a climate to which the manifesto is perfectly suited: a climate in which numbered lists, provocative slogans, us/them dichotomies, virtual communities, and meme activism are right at home. As it happens, Canada is also enjoying a surge in popularity these days. My homeland, once just plain boring, is now (post-Brexit referendum) described in the Guardian as “fascinatingly boring.” Drake deserves some credit, as does our photogenic PM Justin Trudeau. But more generally it is Canada’s reputation for embracing diversity (51% of Torontonians are foreign-born) that has won the country praise – for being a “global village” within a single nation. In terms of national identity, where Canada’s conspicuous lack of an essential “Canadian-ness” was once seen as a weakness, its concomitant lack of narrow nationalism is now rightly seen as a strength. Historically speaking, there are three great manifesto writers: Moses, Marx, and Marinetti. Most of the new wave of manifestos are written under the sway of Marinetti, the leader of Italian Futurism. The incendiary power of Marinetti’s rhetoric, which called on artists to burn the museums, flood the libraries, destroy the past, and embrace the technological future, lit the fuse of the avant-garde that spread like wildfire across Europe. The Futurist formula – which Marinetti summed up as “violence and precision” – has been irresistible to manifesto writers since “The Founding and Manifesto of Futurism” appeared on the front page of Le Figaro in 1909. Hundreds of other Futurist manifestos followed: on painting, cinema, politics, food, fashion, and every other subject under the Italian sun. But the artistic manifesto did not originate with Futurism. The aesthetes of the 1890s published their share, as did the Romantics before them. And neither has the genre’s dynamic blend of art and activism been the sole property of modernist and avant-garde movements. In Canadian literature, for example, few if any of the manifestos I’ve read bear much resemblance to the manifesti of Italian Futurism or the sanguine proclamations of the Vorticist movement in England. Instead, they speak of nation-building, cultural identity, nativism versus cosmopolitanism, and British versus American models; the current state of Canadian literature (where it is said to exist at all); and how a national literature might be encouraged to grow and flourish. Some are hopeful; many others, especially as you read further into the twentieth century, are pessimistic. What unites them – what unites all manifestos – is their sense of crisis and urgency. Stripped to its most basic definition, the artistic manifesto is a polemical, public declaration issued by an individual or group on the subject of the present or future state of art. Some of the many forms it takes include editorials (or even whole magazines), essays, poems, songs, lectures, letters, pamphlets, posters, exhibition catalogues, interviews, and installations. I would argue, in fact, for a broader definition of the artistic manifesto, one that goes beyond the narrow dictates of Futurism. A successful definition should embrace the genre’s full complexity, and its deployment around the globe for purposes far beyond the concerns of the European avant-garde. The literary climate in English-speaking Canada, as in England, was not always receptive to manifestos – especially those calling for radical change or attacking the status quo. The English – aside from William Blake, Wyndham Lewis, and a few other bold exceptions – have never been particularly good at writing manifestos. For whatever reason, England does not provide a fitting environment for the kind of incendiary speech found in Italy or France, for example. As the English Surrealist David Gascoyne wrote in his diary in the 1930s: “Moral bombs and dynamite are of no use whatsoever; the island’s damp climate extinguishes the fuses.” English-speaking Canada is, if anything, even worse. (Quebec is somewhat better.) Nevertheless, efforts were made; little magazines were launched. In the Canadian context, three basic elements of the manifesto are given a new twist. First, the ambivalent relationship between writer and reader is particularly strained, because the Canadian reader’s appetite for groundbreaking literature has often been perceived as very slight. Second, the Italian Futurist struggle to shrug off the weight of European history is transformed into the common (albeit false) assumption that Canada has no culture and no past. And finally, the arrogance and audacity that are an inherent part of the manifesto become the focus of a peculiarly Canadian anxiety. Is it right to demand anything? Do Canadians need or deserve a national literature or a national identity? To echo our Nobel laureate Alice Munro, who do we think we are? Identifying and addressing a Canadian audience is one of the preoccupations of Canadian literary manifestos, from St. Ursula right through to the belated arrival of modernism in Canada after the Second World War. One change that occurred in the modernist period, however, is that more writers chose to turn their backs on a general readership. Preview magazine in the 1940s, for example, advertised itself as a testing ground for new ideas – but it averaged just 125 mimeographed copies per issue and was sold by subscription, so it was strictly for a coterie crowd. The plain reader be damned, it seemed to say. But to start at the beginning: in the year of Confederation, 1867, the Irish rebel and poet turned Canadian founding father Thomas D’Arcy McGee raised the issue of a national literature in a speech called “The Mental Outfit of the New Dominion.” In the speech McGee put forth his vision for the new nation, and the role that culture would play in it. He argued that Canadian identity should be based not on what he called an “apish civilization” achieved by the accumulation of material wealth, but must begin in the intellect – the “mental outfit” – of the people. McGee raises a question often raised in these manifestos. Why, if Canadians are so literate and well read, can we not produce a more active literary culture? It is a problem that still plagues our country. McGee had come from Ireland, a materially poor country that had nevertheless already produced a wealth of literature, and he challenged our passivity as colonial subjects. “We are … a reading people,” he wrote, “and if a reading, why not also a reflective people? Do we master what we read? Or does our reading master us?” As the reading material came mostly from England, this line of questioning also challenged perceptions of power and mastery that some of the settlers reading McGee might have held. More than a half-century later, an audience worthy of the name still seemed to exist only somewhere in the future. Lionel Stevenson declared in his “Manifesto for a National Literature”: “The existence of any literature depends on the audience … and every Canadian who begins to open his mind to what his country really means is advancing the day when Canadian literature can become a recognized and vital entity.” Fairly rousing stuff, to be sure. Then in the late-1920s, as the first signs of a robust modernism began to appear in Canada, writers turned against readers altogether. Readers suddenly became the enemy – the hostile philistine hoards that any self-respecting writer (in the mold of James Joyce or Ezra Pound) would battle with the sharp wit of his or her pen. The first issue of the Canadian Mercury in December 1928 opened with a manifesto describing a tide of “reactionary opposition” to the journal that threatened its very birth. The editors were “determined,” they wrote, to preserve the Mercury’s lofty standards and daring editorial policies in the face of this opposition, and to demand “a higher … standard of literary criticism in Canada.” The “us” and “them” of modernism had reached Canadian soil. But would it take? Canadian poets must lose their conservatism, Kennedy argued, along with their geographical obsession. He endorsed Morley Callaghan’s suggestion that the rhythms and “imagery” of Canadian speech represented the best hope for a distinctly Canadian literature, and in true manifesto fashion he insisted that it was not too late for change. The “aesthetic flag-pole sitt[ers]” of yesterday, Kennedy declares, can be the authors of “real, Canadian and contemporary” poetry tomorrow. They must only listen and engage with what was actually happening – not in the ivory tower or up the aesthetic flagpole, but at street level. Canada’s modernists did not share McGee’s romantic idealism, and they despaired at the seeming inability of Canadian literature to free itself from the shackles of convention. In the foreword to Open Water (1914), a book often credited as being the first example of modernist poetry in Canada, Arthur Stringer suggested that progress in Canadian literature was held back by the dragging weight of the Old World. As he put it, “pioneering with so heavy a burden is out of the question.” It was time to shrug off the baggage of the Old World and break a new path. He went so far as to call the faithful adherence to conventional rhyme and metre “necrophilic,” and he compared the use of “medieval” poetic forms to the wearing of chainmail “against machine-guns” – a vivid analogy in 1914. At the other end of the modernist period, a 1954 editorial on “Canadian Culture” in CIV/n showed that little had changed in terms of perception even by the mid-1950s: “One much-used excuse for Canada’s lack of whatever-it-is, is the fact that it is a young nation. From a ‘young nation’, one would expect fresh, rich, original products, with spirit, vigour.” Instead, Canada remained a nation of young fogies – poets wearing elbow patches before their time. Whatever later generations thought of his poetry, it was the fiery D’Arcy McGee who first introduced the aggressive manifesto into Canadian literary discourse. The short, sharp rhetoric of his polemical essays and speeches anticipates the incendiary manifestos of the next century. McGee’s manifestos were a product of the cross-pollination of poetry and revolutionary politics, directly influenced by the upheavals of the 1840s. Marx and Engels can be heard in “A Canadian Literature,” published in the New Age in 1857. “All Canada is interested in the creation of a literature,” McGee declared, framing the creation of a national literature as a revolutionary struggle against the old status quo that believed “the literature of the mother country” should serve well enough for its colonies. McGee’s pluralistic vision of Canada still resonates. “We can gather from every land,” he wrote, “and mould our gleanings into a form, racy of the new soil to which it is adapted.” Raised as a revolutionary in Ireland, McGee nonetheless saw in his adopted Canada an opportunity to avoid the endless sectarianism of the Old Country. 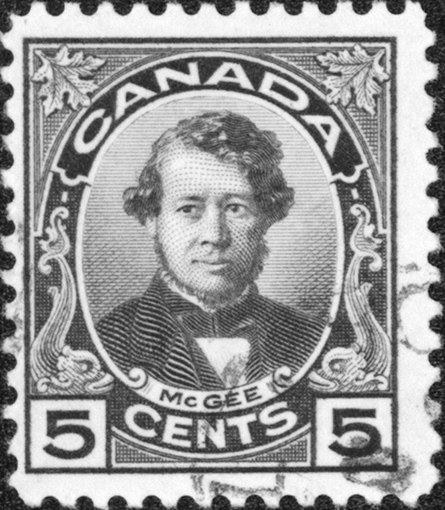 He called for “the acknowledgement of all elements, foreign and provincial”; he wanted an end to “‘clannishness,’ and the recognition of all nationalities in one idea and in one name.” Sadly, McGee did not live to see his dream realized: he was assassinated in Ottawa in 1868, allegedly for betraying his militant republican roots. What D’Arcy McGee encapsulates, in fact, is the tension between the desire for audacity and revolt, on one hand, and for moderation and tolerance on the other. Do Canadians have the audacity to write manifestos? Do we want to participate in such a historically violent, polarizing genre? Stevenson’s “Manifesto for a National Literature” of 1924, the first manifesto for Canadian literature to call itself a “manifesto,” ends not with a bang but a whimper. “I am prepared to admit that my analysis, as it stands, is moonshine,” Stevenson wrote. “I not only admit but proclaim emphatically that the outline of it which I have given is incomplete and clumsy; but if I provoke any person to think about the matter more attentively then I am content.” Content? When have you ever seen that word used in a manifesto? It is truly an odd mix of vocabulary: “proclaim” and “provoke” alongside “clumsy” and “content.” But to his credit Stevenson argued that a national literature in Canada “is more likely to be reached through a sincere effort to perceive the country’s inward virtue … than through oratory and aggression,” which he saw as being anathema to the Canadian, as distinct from the American, national character. “They say we lack audacity,” begins F. R. Scott’s poem in The Blasted Pine, co-edited by Scott and first published in 1957. 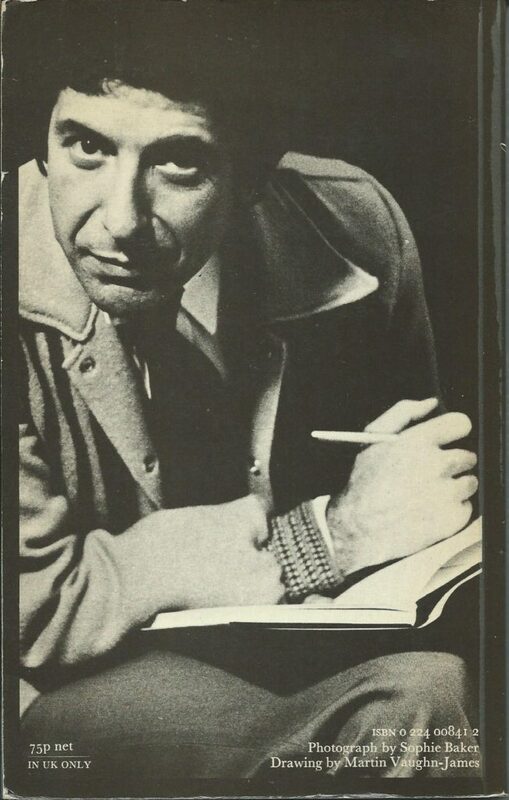 “They say,” it goes on, “that boldness and experiment are far from our complacent thoughts.” Added to a later edition of The Blasted Pine is Leonard Cohen’s “The Only Tourist in Havana Turns His Thoughts Homeward.” Cohen borrowed the revolutionary manifesto form to evoke the time and place of writing (the young poet visited Havana in 1961). He used it to comment ironically on issues of Canadian identity: “let us make the French talk English / not only here but everywhere”; “let us terrorize Alaska”; “let us threaten to join the U.S.A. / and pull out at the last moment,” and so on. Sometimes, as Canadians, it is hard to “find our serious heads” (in Cohen’s phrase) – to take ourselves, and our culture, seriously. For that reason, at times, the manifesto’s rhetorical swagger may seem out of place in our literature. It is too loud, too showy, too arrogant and undemocratic. Who do you think you are? One strange and worthy exception to this lack of “fighting” manifestos is a now obscure early version of Marshall McLuhan’s book Counterblast. The later 1969 edition is a state-of-the-culture book that features a striking layout by Harley Parker and McLuhanesque pronouncements such as: “Today we live invested with an electric information environment that is quite as imperceptible to us as water is to a fish.” It captures the Information Age but also the Age of Aquarius; McLuhan’s style was influential not least on Douglas Coupland, who has made a career in a similar vein. By contrast, the earlier 1954 Counterblast is simply Wyndham Lewis and Ezra Pound’s original London BLAST transposed to Canada. 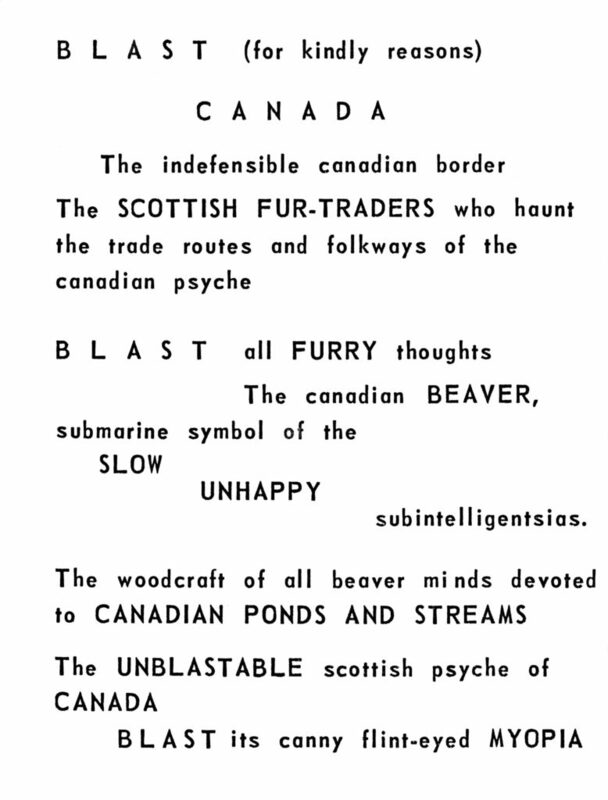 Meant as a wake-up call to “beaver minds”, it is filled with lines that express the same anxieties as earlier Canadian manifestos, albeit in a bolder, if borrowed, avant-garde voice. For example: “BLAST England ancient GHOST of culture POACHING the EYES of the Canadian HAMLETS”. Marshall McLuhan famously quipped: “Canada is the only country in the world that knows how to live without an identity.” Is this, finally, our manifesto? 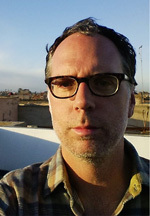 Julian Hanna was born in Vancouver and lives on the island of Madeira. His research on manifestos and other subjects often appears in academic journals; his creative writing can be found in The Atlantic, 3:AM, Minor Literature[s], Numéro Cinq, and elsewhere. He is a previous contributor to Berfrois. Twitter: @julianisland and @crapfutures. Italian Futurism created the template of the avant-garde manifesto adopted by all the ‘isms’ that followed, and violence was in it from the start. “Violence and precision”, the Futurist leader Marinetti proclaimed, is the recipe for a successful manifesto. For most of the last century, newspapers were a licence to print money. Sports car-driving sales people boasted of turning down clients because the paper was too full; they couldn’t take another ad. Today, global society is at the stage of searching for a model of social cohabitation. The problem lies in the fact that global societies have constructed their identities through culture and religion and therefore the process of cohabitation with others appears only as a process of assimilation.